These cookies are wonderful! I get asked to make these every Thanksgiving and Christmas. I have used the original recipe though, not this updated one. Is 4 teaspoons of baking soda correct or a typo? I hate to mess with perfection, I think the original recipe is wonderful. I personally like to make the cookie dough,and using a small cookie scoop, form dough into balls and roll into sugar mixture. 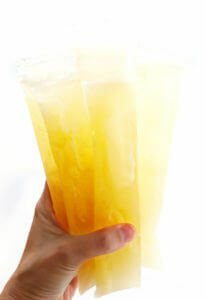 I refrigerate them in a container or Ziplock bag for an hour or over night, and then bake them well chilled. They don’t spread and stay nice and chewy. Hi, my cookies are turning out too cakey. I’m using white wheat flour…could this be the cause? Delicious! I bought some candied ginger and chopped it medium fine and added it to the dough. I like the surprise difference in texture and the extra ginger. I made these once before and chopped the ginger fine and it basically just melted into the cookies so if you want even small ‘chunks’ you have to cut the ginger bigger than you would think. Also, I added an extra 1/3 of all the spices and it was not too much. I also made them extra big and that worked too. Better double this one ! I made these cookies for the first time this weekend and they are one of the best cookies I’ve ever tasted! My husband hasn’t enjoyed food and lost his sweet tooth after chemo and he was thrilled by how much he enjoyed the flavor and texture. Thank you for sharing this recipe! I made these and bright them to work. One of the guys was almost tearing up because they reminded him of his grandmother. So, so yummy. 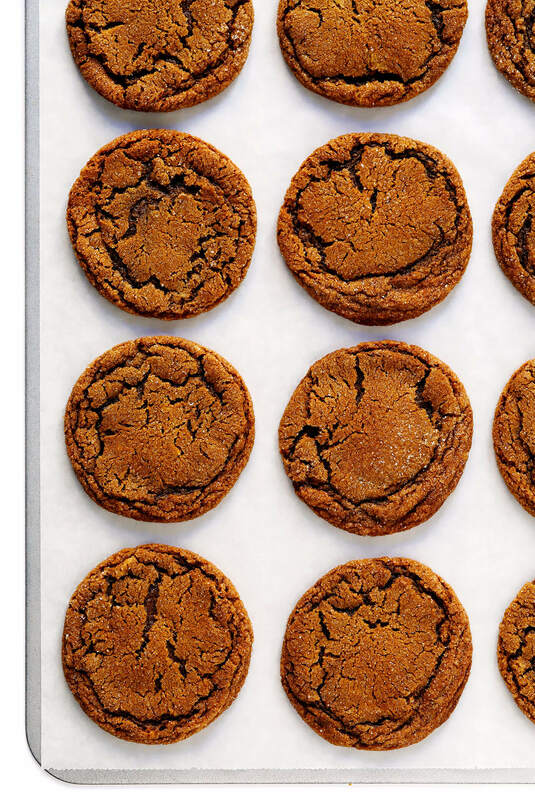 I just made these cookies this evening and these are the BEST ginger molasses cookies ever. I have been making a similar cookie for years but this recipe is superior. I forgot to roll them in sugar before baking but they were still delicious! Any tips on making these in advance? Do they freeze well? The one recipe makes a large amount of cookies and probably won’t need all of these in one round! It’s a pretty easy recipe to halve if you don’t want to make so many. Halving still makes two baking sheets worth. I halved the recipe last night and made one GF batch with fresh ginger and one traditional batch. I followed the recipe exactly as written and they were amazing! Just made these cookies for a friend, they’re absolutely delicious! They taste JUST like something grandma would make! Turned out so good! I’m not much of a baker and don’t have a mixer so I mixed the ingredients with my hands… hey it worked :) Unless you are cooking for a party/event, I suggest halving the recipe – makes so many cookies! Only thing I would do differently next time is add a tad more ginger. They taste great as is, but I’m a ginger lover. Thanks for the great recipe! 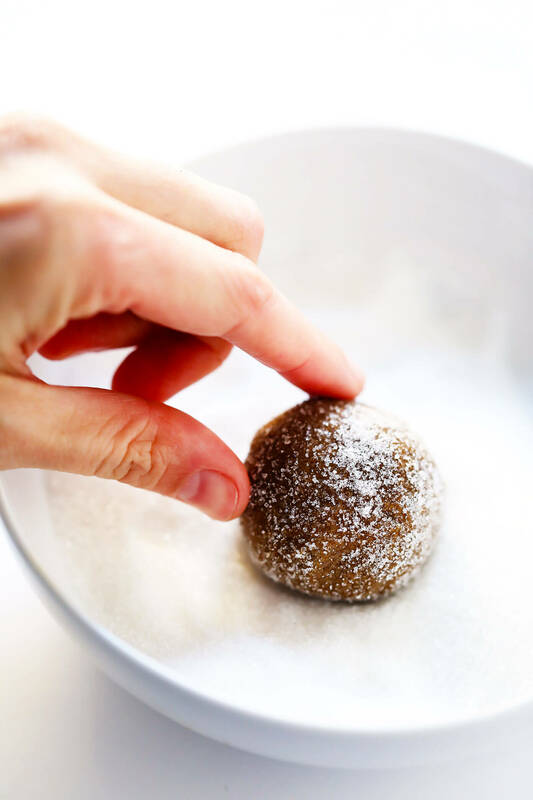 Best molasses cookies we’ve ever had! 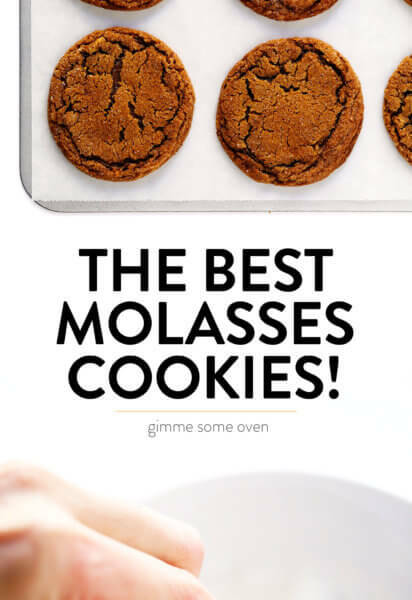 These are THE BEST molasses cookies, I come back to this recipe again and again and always get raving reviews when I share! It’s true about the room temperature butter. As I was slicing my butter up toss into the KitchenAid, I noticed some resistance in the center of the block. I had taken it from the fridge an hour prior and figured it was warm enough. Nope-FLAT cookies. I couldn’t believe it. Every other time I’d made there cookies they were perfection. Still delicious, but not the glorious beauties I had made many times before. Heed the room temperature advice! Great recipe – these cookies’ appearance is quite sensitive to cook time. If I do 9 minutes they look like in the pictures on this website…10 minutes and they are a darker toastier color still delicious – just a note for those who might find their cookies looking toastier. Made these yesterday and they are absolutely delicious! 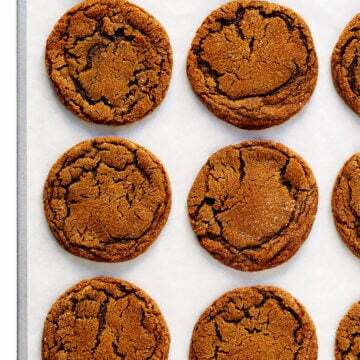 I’ve never made a ginger cookie, this recipe will be a go to from now on. I’m VERY picky when it comes to the recipes I use. 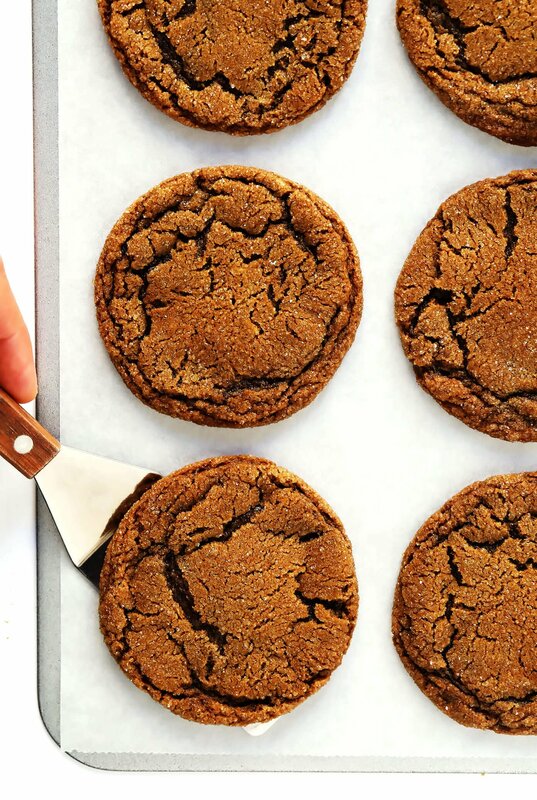 This cookie recipe has no-flaw and truly makes the best molasses cookie I have ever had! The batch is quite large, so depending on how many cookies I need, I sometimes half it :) Awesome recipe, Ali. Thank you!! Love the cookies. My only tip is wait to preheat oven because when the dough is done it requires an hour in refer to get hard enough to work into balls. The oven would be wasting energy being on during the chill time. I used earth balance instead of butter because we are a no dairy family and it worked great. Sooo good but next time I will use 1/2 the salt. I used coarse sugar and it turned out wonderfully sugary on the outside. I made these, and have the second batch in the oven! I cut the recipe in half, and though they don’t look exactly like the pictures, they are really good. This is literally the best cookie I have had in a while. Also, let me note this important detail: I thought I didn’t have cinnamon (I found out afterwards that I did), and I also don’t think I have any ginger. So, what I did was substitute pumpkin spice (containing cinnamon, ginger, nutmeg, allspice & sulfiting agents–according to the “ingredients” on the back) for both cinnamon and ginger. Also, my measurements when making these were not exact, and I didn’t follow the recipe to a “T”, but they turned out well. Have a great day, and thank you so much for the recipe, Ali. Absolutely the best cookie I have ever eaten. DELICIOUS!!!!! I’m thinking of baking these tomorrow…Can someone tell me, is 4 tsp baking soda correct? Hands down my favorite and even best looking cookie I have ever made. I typically do not use eggs and keep things as healthy as I can…even with flax meal egg replacer, these cookies were absolutely FLAWLESS! The turbinado sugar makes them even more delicious! This recipe is perfection! It was my first try at ginger molasses cookies and I couldn’t be more pleased with the result! Mine came out looking just like the photos, which never happens! These are delicious! I was out of butter and so switched it for coconut oil, and they still turned out amazing! I will definitely be making these again. This variation was the result of accident when we forgot to add the salt to the dough. Not trusting anything that isn’t salted, we tried this remedy and it took the cookies over the top. Everyone who eats them asks what exactly it is that makes these so wonderful. The original recipe is excellent; this just adds that little something extra. Oh. My. Goodness. I’m not even a big fan of molasses cookies, but I had all the ingredients and thought I’d give these a try. They are SO good! I rolled mine in tubinado sugar, and they have the most wonderful crispy caramel-ey outside, with a chewy, buttery delicious interior. I cheated a little and used my cookie scoop to form them before chilling, then popped the cookie sheets into the freezer for about ten minutes, then I rolled in the turbinado. These took less than an hour, start to finish, and did I mention they are DELICIOUS? Okay…. These were the best cookies I have ever eaten! I’m trying my best not to make these weekly, I have zero willpower with them in my kitchen. Everyone raved over these cookies. They had the best texture, so chewy and lovely! I loved the bold spices in these; they screamed “It’s the Holiday’s” to me! Everyone, do your loved ones and friends a favor and bake a batch of these beautiful babies. You’ll see some very happy faces! This recipe is worth every moment you put into pulling these together. On a side note, I only had whole cloves and ended up quickly grinding them fresh for this recipe. I will never buy ground clove again… grinding whole is the way to go! Ali, thank you for sharing this wonderful recipe. 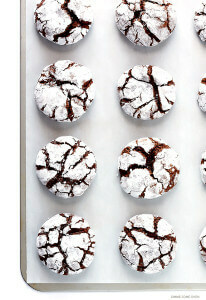 Would these make a crinkle cookie if they were rolled in powdered sugar? I’m so excited to make these! Chewy ginger cookies are soooo good. My dream is to make those THICK, chewy, delicious cookies you find in good bakeries. How on earth do they make them almost an inch thick, yet still properly baked?! haha… Do you have any tips to help me achieve this? :) Thank you! I am going to make these tonight. I am on my second chemo treatment and have read that ginger helps with nausea – plus, these look delicious!! I would love to make this dough a few days before I need to bake them. Will this store in the fridge a few days? These are seriously THE BEST cookies ever!! can you 1/2 this recipe ? Thanks! Definitely! The recipe as written makes a very big batch. Replace half the butter with vegetable shortening a.k.a. Crisco for a thicker chewier cookie. Works for all drop cookies. 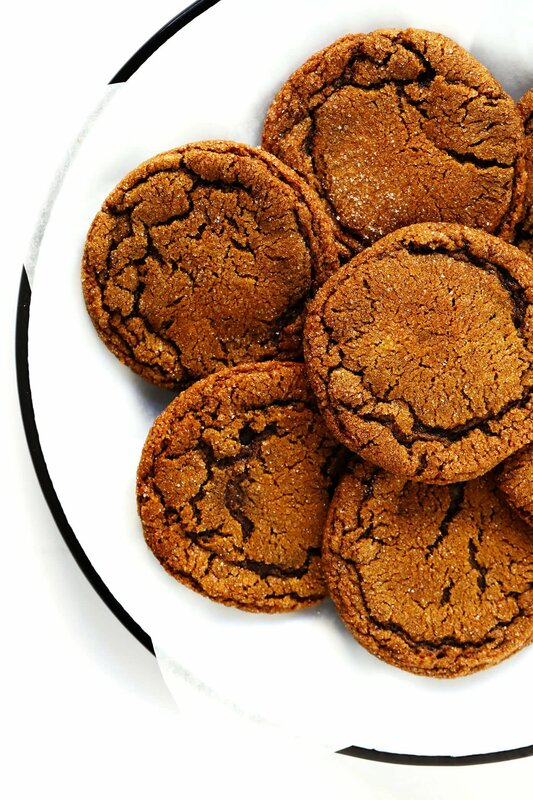 I’ve made your chewy ginger molasses cookies in the past and loved them. I just tried finding the recipe to share for a cookie exchange, but I had a hard time. Thank you for the note describing the changes from your last rendition because the ingredients and directions were slightly modified. I’ll be trying the changes soon and look forward to trying them on my family. Glad to see the printed version of the new recipe has your website noted! These are to DIE FOR! I have made these twice, in the last 3 weeks! They are that good and just plain irresistible! I bake mine on 325 for 11 minutes – that’s just me though. OBSESSED with this recipe!!!! We make it every year! This was the first time I’ve ever made Ginger Molasses cookies, and I’m so glad I found this recipe. The cookies are so soft and chewy, as long as you take them out of the oven as soon as they start to crackle on top! I followed the recommendation made in another review to wait to add the salt (but I only added 1/2 teaspoon) until the end with the sugar that you roll the cookies in, and they turned out excellent! 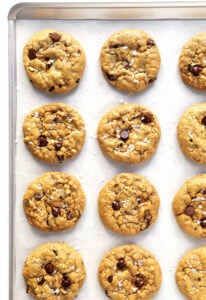 Other alterations: I added a small pinch of coarse sea salt to the top of each cookie after they came out of the oven, and I also added butterscotch chips for an added punch of flavor. These are my new go to Christmas cookie for sure! I teach chemistry and I make these cookies every year for my students on “Mole Day” (I refer to them as “Mole-“asses cookies). They are always a huge hit! They’re so easy, the yield is huge, and they are hands-down my favorite cookie. Ally I need help!! I live in Italy and cannot find molasses ANYWHERE in the supermarkets here. Is there a substitute I could use? Darn, it can be hard to find in Europe! It’s called “miel de caña” or “melaza de caña” in Spanish, if that’s any help. Usually the import stores here will carry it, or healthy/organic groceries. Unfortunately there’s no good substitute for this recipe. Best of luck! Try looking for Treacle. I believe it’s the same thing. This probably a VERY amateur baker question (ha! ), but I wanted to be sure – salted or unsalted butter? I’m never sure which unless a recipe explicitly states it, but that’s probably just my inexperience. Thank you!